During her career spanning more than 20 years, Haugen has created music with an expressive lyrical style that is both moving and meaningful. She is drawn to projects that reach deeply into the well of human experience. Her willingness to confront challenging emotions and issues through her music, whether they are personal, cultural, or spiritual, inspires performers and audiences alike. 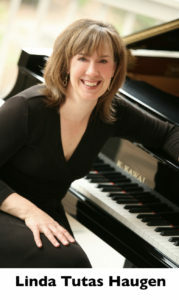 Grants, Awards and Residencies – She has received many grants and awards from organizations including: American Composers Forum, ASCAP, Bush Foundation, Minnesota State Arts Board, and Jerome Foundation. As one of four awarded nationally she received a three-year fellowship from Meet the Composer under its New Residencies program in 1999-2002. As a recipient of a Minnesota 2014 Artist Initiative Grant, she is currently researching ancient Norwegian vocal and instrumental music, and composing contemporary chamber works incorporating these traditions. Commissions – Haugen has received 38 commissions in the past 15 years. Prominent among them are: Anne Frank, A Living Voice, a 25th Anniversary work for the San Francisco Girls Chorus; a four-movement orchestral composition for the National Kidney Foundation in celebration of 50 years of organ transplantation – Transformations of Darkness and Light; a work for trumpet and organ, Invocation and Remembrance, for the American Guild of Organists for its National Convention; and her opera, Pocahontas, commissioned by the Virginia Arts Festival and the Virginia Opera, commemorating the 400th Anniversary of the founding of Jamestown. Performances – Many of her works have been performed extensively: Anne Frank: A Living Voice has received over 27 performances since 2004 across the U.S., and a 2013 European premiere in St. Gallen, Switzerland; The Fable of Old Turtle for Orchestra, Native American Flute and Narrator, has had 55 performances since 2001, including three on Native American reservations; and Pocahontas, has received two complete productions in four years. In addition, her choral compositions have been featured at the National Collegiate Choral Organization Conference and at Regional and National American Choral Directors Association Conferences. Community Commitment – Haugen has extensive experience as a composer-in-residence and teaching artist, and often works with arts organizations, performing ensembles, and educational institutions to champion the creative process and the importance of new music. She is on the faculty of the National Federation of Music Club’s summer Junior Composers Institute (U of MN). Haugen is a founding board member of the Independent Music Publishers Cooperative (imp.coop), a national organization of composer/publishers. She is a member of ASCAP.